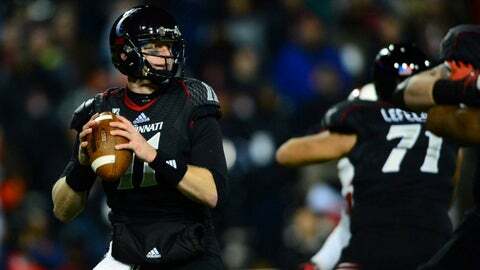 Cincinnati Bearcats quarterback Brendon Kay (11) looks to pass during the third quarter against the Louisville Cardinals at Nippert Stadium. Cincinnati and North Carolina reached the Belk Bowl on almost identical paths. Both teams had some early season struggles. Both made midseason changes at quarterback. Both went on big runs during the middle of the year, picking up steam to go on long winning streaks. And then both lost close games in their regular-season finales to longtime rivals. Now each has a chance to end the year on a high note when they meet Dec. 28 in Charlotte. "They are a lot like us because they had a slow start and then won a lot of games in the end," Bearcats coach Tommy Tuberville said. "We are probably a much better team now than we were at the beginning of the year, as they are." "This is a resilient bunch of guys that kept believing in one another throughout the year and I’m glad they were rewarded with a bowl game," North Carolina coach Larry Fedora said of his team. 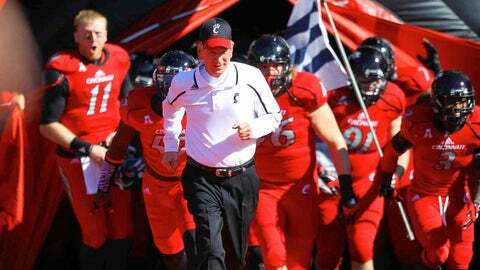 "We’re looking forward to facing a very good Cincinnati team led by an outstanding coach in Tommy Tuberville." Cincinnati (9-3) is playing in the Belk Bowl for the second consecutive season after defeating Duke 48-34 last December. This year, the Bearcats rolled off six straight wins during the middle of the season, and wound up finishing third in the AAC. With an offense that averages 33.3 points under the leadership of quarterback Brendon Kay, the Bearcats rolled through the back end of their schedule, finishing the regular season with 166 more points than their opponents. Kay was not the starter when the season kicked off, but took over in the team’s second game following an injury to first-stringer Munchie Legaux. Kay’s play improved as the season progressed, peaking with a 405-yard, four-touchdown, no-interception performance in a 38-24 win at Rutgers on Nov. 16. He hasn’t always been 100 percent healthy himself, but he became the fourth quarterback in Cincinnati history to throw for more than 3,000 yards in a season. "I tell you that kid competed and he did it on one leg. His ankle is so bad. He’s been wanting to play and push through it and it’s been that way for about six weeks and he has only practiced about one or two days a week," Tuberville said of Kay following his team’s 31-24 loss to then-No. 19 Louisville on Dec. 5. Kay completed 22 of 40 passes in that game for 304 yards, while also rushing for two touchdowns, but threw a pair of costly interceptions. "He doesn’t throw the ball much because his shoulders are so banged up but I tell you he is a warrior." The Tar Heels (6-6) made their change under center later in the season, after starter Bryn Renner suffered a season-ending shoulder injury Nov. 2. The more mobile Marquise Williams took over and finished the season with 14 touchdown passes while also leading the team in rushing with 531 yards and six scores. No matter which quarterback has been playing for North Carolina, the best option has generally been throwing it to Eric Ebron. A finalist for the Mackey Award, given to the nation’s top tight end, Ebron has already announced he will be entering the 2014 NFL Draft following the Belk Bowl. The team’s leader in receptions (55) and yards (895) said he is looking forward to facing the Bearcats defense, but can’t promise anything big for his final game in Carolina blue. "I just go out there and do what I do best," Ebron told the school’s official website. "Whatever special happens is built up inside and already packaged for the game. I can’t justify that or make something spectacular happen, it’s just going to happen. It’s a bowl game; I’m here to have fun." North Carolina started the season 1-5, then went on a five-game win streak to become bowl eligible. A season-ending 27-25 loss to Duke hurt, but the resiliency shown by the team resonated with their head coach. "I’m excited for our team, especially our seniors, who fought through some early season adversity and won five of the last six games to become bowl eligible," Fedora said. Fedora says the team hasn’t decided yet who will call plays in this game after offensive coordinator Blake Anderson took the head coaching job at Arkansas State. The Tar Heels are just the sixth team since the regular season expanded to 12 games in 2006 to start 1-5 and make a bowl game. North Carolina is 2-0 all-time against Cincinnati, with the last meeting a 51-16 victory Sept. 14, 1991, in Chapel Hill.